It is obvious that there is plenty of controversy surrounding the Donald Trump presidency. What is less visible and well known is that many of the policies Trump has put in place have been good for U.S. business as well as labor and wage growth. It’s not my desire to partake in the political debate. It is my goal to find good investment ideas. The economic policies currently in place provide growth opportunities for a lot of U.S. based businesses. 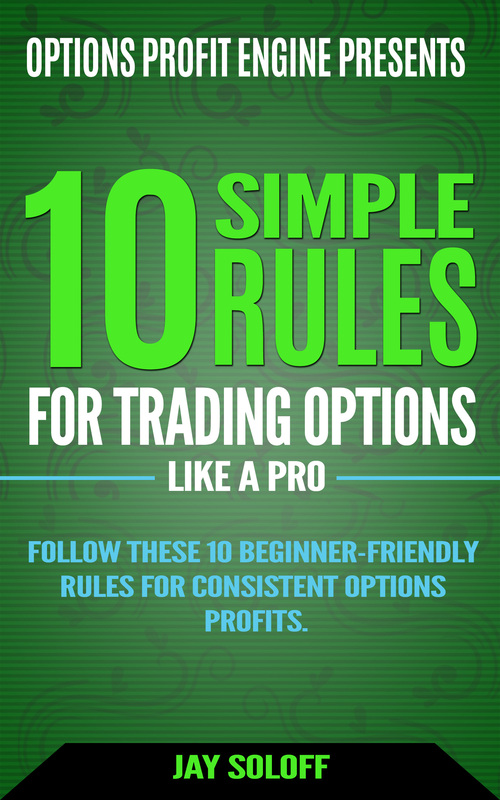 Let’s find some that pay attractive dividends and do so with monthly dividend payments. First, a quick review of some economic data. Under the Obama administration, the U.S. gross domestic product never reached 3% growth for any of the eight years. Average annual GDP growth for the prior administration was 2.1%. In Trump’s first year in office the U.S. GDP grew by 2.2%. His second year (2018), when the policies started have an effect, the economy increased by 2.9%. The Conference Board predicts 2.6% GDP growth for 2019. While still not topping 3%, the Trump growth rate on average is 31% higher than the average of the previous administration. That increased growth percentage is huge in a $20 trillion economy. The economy has added 4.8 million new jobs during the first two years under Trump. Of that number 491,000 were well paying manufacturing jobs. The Obama administration produced just 60,000 manufacturing jobs during its final two years. The latest jobs report showed year-over-year wage growth of 3.4% was the strongest in 12 years. Since a large part of the economy is driven by consumer spending, wage growth is a strong sign for continued overall GDP growth. The facts above show that in the U.S. businesses are confident and hiring more workers. They are also paying their workers more. People with larger paychecks and more money coming into their bank accounts will be willing to spend on goods and services. Three monthly dividend stocks in particular are poised to take advantage of these economic trends. 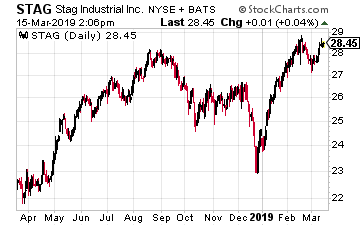 STAG Industrial Inc. (NYSE: STAG) is a real estate investment trust (REIT) focused on the acquisition and operation of single-tenant, industrial properties throughout the United States. Industrial properties are what manufacturing, ecommerce and logistics companies need and lease. In a growing economy, demand for these types of properties grows even faster. STAG owns almost 400 properties with 350 different tenant companies located in 39 states. This REIT has rewarded investors with annual dividend growth and currently yields 5.0%. EPR Properties (NYSE: EPR) is a REIT that is well positioned to benefit from the bigger paychecks earned by the working middle class. One of EPR’s business divisions owns 175 megaplex theaters, retail and family entertainment centers. Another division owns golf entertainment complexes, ski areas, and amusement and activity centers. All of these are places where people with a little extra money in their pockets go to spend it. EPR is the landlord for the properties and they are leased on triple net leases by independent operators. The monthly dividend gets increased by 5% to 6% every year and the stock currently yields 6.0%. The hotel business is one that traditional cycles along with the economy. A growing economy means more people staying in hotels for both business and leisure. However, the Trump economy is a mixed bag for hotel operators, with rising wages and the challenge of attracting employees. Hotel REITs own a portfolio of branded hotels and an owning REIT will participate in the profits of individual properties. 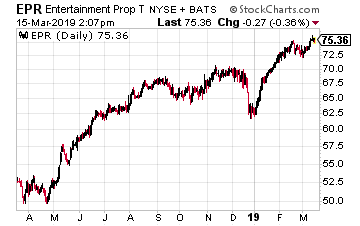 The good news is that hotel REIT dividends are very secure with the potential for future dividend growth. 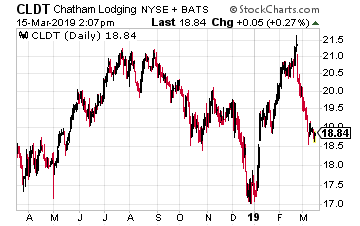 Chatham Lodging Trust (NYSE: CLDT) is a stable monthly dividend paying lodging REIT whose shares yield 7.0%.